In the Policy Advocacy Clinic, interdisciplinary teams of law and public policy students pursue non-litigation strategies to address systemic racial, economic, and social injustice. The clinic’s approach is bottom-up (grounded in the lives of real people), problem-based (addressing pressing social issues), and client-driven (accountable to advocacy organizations). Students support local and state change campaigns while exploring the capacities and limits of law and public policy to solve problems. Current projects include state and national efforts to reduce the harmful and racially discriminatory impact of fines and fees on low-income people in the criminal justice system, with a special emphasis on the interests of youth and people experiencing homelessness. A multi-year project to address juvenile fees in other states may require clinic-funded travel outside of California. In the clinic, students learn substantive law and policy skills. They interview clients and experts, conduct legal and social science research and analysis, and consult stakeholders (community members, policy and advocacy organizations, public officials, academics). On behalf of clients and partners, students complete written assignments, including: draft legislation, rules, and policies; internal work product for clients; and external work product for public dissemination, such as fact sheets, public comments, policy briefs, research reports, practice manuals, and know your rights materials. Students also hone their oral advocacy skills by preparing, mooting, and delivering testimony and public comment to a variety of audiences, including city councils, county boards of supervisors, regulatory bodies, and state legislatures. The clinic instructional staff includes Jeff Selbin, Stephanie Campos-Bui, Ahmed Lavalais, Angela Carter and Olivia Layug Balbarin. Summer 2019 Paid Fellowships for JD and MPP Students. PAC Students Present Research Findings on Juvenile Fees at the County of San Mateo Board of Supervisors Meeting (June 19, 2018). PAC Students Present Research Findings on Juvenile Fees at Contra Costa County Board of Supervisors Meeting (October 25, 2016). 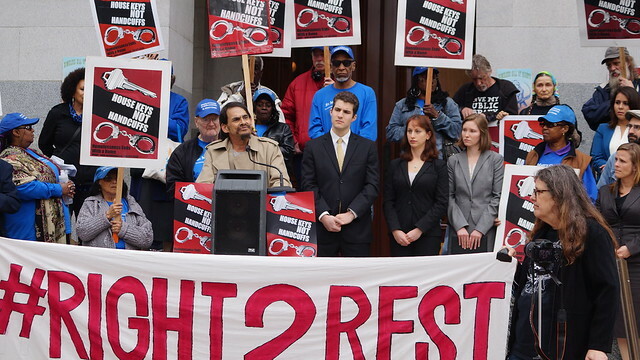 PAC Students Present Key Research Findings about California’s Anti-Homeless Laws at a Press Conference on the Steps of the State Capitol (February 2015).